It's here! Time to dream in epic colours with Zaranna, the Horse Dreamer. I invite you to experience the beautiful, tempestuous world of Equinox, and an adventure beyond imagination. I wrote this book with my eldest daughter. We had enormous fun creating the different characters and creatures in the world of Equinox, which is dominated by equine life-forms such as Pegasi, Storm-Horses, Magma Horses, Equipedes ... it's a long list! 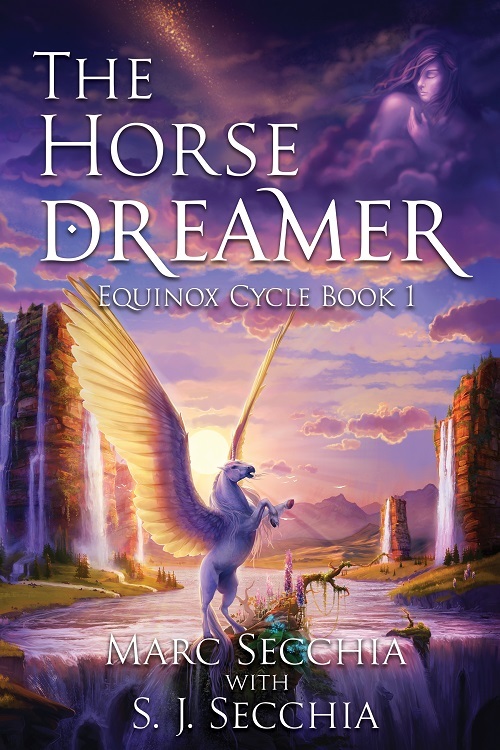 The Horse Dreamer is a Young Adult epic fantasy for the horse-lover in you. Suitable for all ages, this is a clean, exciting read. Oh, we may have sneaked in a few dragons . And an evil wizard or three, deadly swamps, world-spanning storms, a human chameleon, water horses, an air slide, epic battles and a few other surprises. Trapped in a car wreck, crushed by a train. In seconds, Zaranna’s world is torn apart and she must start life anew, as a survivor. A double amputee. Yet why does this promising equestrienne remember a flash of sulphurous fire, and a crimson paw hurling her mother’s car onto the train tracks? Why does a tide of beguiling butterflies flood her increasingly chaotic dreams? As Zaranna Inglewood adjusts to life minus legs, plus gorgeous Alex, the paramedic who cut her body from the wreckage, she learns the terror of being hunted. Relentless and inimical, the enemy lures her to a world where dreams shape reality. Equinox. A world of equinoctial storms; lashed by titanic forces of magic, dominated by the Pegasi and their centuries-old enmity with Human Wizards and the Dragons. This is a world where a girl can Dream her destiny. Where her soul can fly, or be chained forever. She is Zaranna, the Horse Dreamer. Survivor. Fighter. A girl who doesn’t need legs to kick an evil fate in the teeth. All she needs is courage–the courage to Dream. Purchase The Horse Dreamer now at Amazon in Kindle.